Set of basalt stones for stone therapy UMS-76TC, buy for 304 in Europe. The set Super Deluxe 76 Pcs Massage UMS-76TC collects almost all the variants of basalt stones for your private practice or beauty salon. One X-large flat basalt stone oval, which is used to influence the buttocks. Fourteen large flat stones are easy to use and have streamlined form. You can use two stones to massage the abdomen, four stones to massage the buttocks, eight stones for the hips. Eighteen standard oval stones have streamlined form and pleasant to the touch. They are used for heating and massaging the calves, feet, hands, arms, and neck. Next six stones are ideal for forehead, crown and nape. Four medium-sized basalt stones in the form of semi-circle. These are good for the arches of the feet and buttocks. Six Maltese basalt stones are ideal for the feet and hands. Two curved basalt stones for foot massage, plus four point basalt stones. 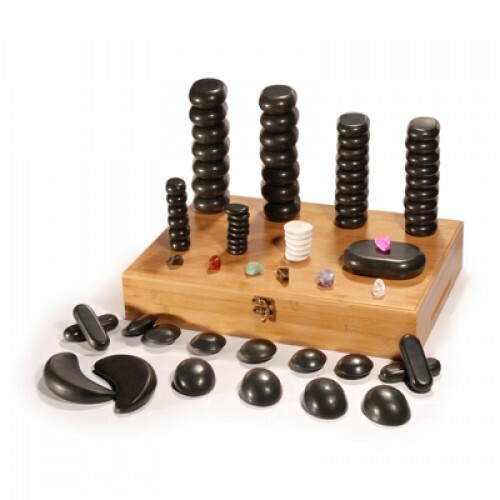 In addition, the set includes eight stones for the toes, the seven chakras and six mini marble stones, rounded for cold stone therapy in your salon.